History abounds with would-be saviors who promised peace and prosperity. But without exception, they failed to deliver. Have we learned the lesson that no human being or form of government can deliver us or bring salvation in an ultimate sense? A Ghanaian friend once related that as a child in school he was required by the authorities to repeat daily, “Nkrumah is the new Messiah.” At the same time, government radio was saying of the president, “Osagyefo [the Redeemer] is immortal and can never die.” All of this was a sure sign that yet another personality cult had emerged. Ruling from 1957 to 1966, Kwame Nkrumah was the first to govern the postcolonial Gold Coast, or Ghana as it became known. According to historian Martin Meredith, in the lead-up to the declaration of political freedom, “party newspapers built up the image of a man of supernatural powers, a prophet, a new Moses who would lead his people toward the cherished land of independence. . . . Ordinary people came to regard him as a messiah capable of performing miracles.” Coincidentally, the hardworking, charismatic, nondenominational Christian and Marxist Nkrumah developed only one favorite piece of classical music—the “Hallelujah Chorus” from Handel’s Messiah. Like many an aspiring political christos before him, Nkrumah suffered delusions of grandeur that put him in bad company. Meredith notes that, “believing himself to possess unique ability, capable of achieving for Africa what Marx and Lenin had done for Europe and Mao Tse-tung for China, he created an official ideology, calling it Nkrumahism.” He also suffered the ignominy of being deposed. The president’s indulgence in autocratic practices and his imprisonment of political opponents had compromised the development of his personality cult, and the people rose against him. While he was on a visit to China, the police and army acted. Youth groups now marched through the streets with placards reading “Nkrumah is not our Messiah.” Rejected, he went into exile in nearby Guinea and died of cancer in Romania in 1972. But once more the broader lesson about ruler cults went unheeded, especially in nearby Liberia. As a result, an echo of Nkrumah’s messianic pretensions (and departure) was heard in 2003, when the American-educated Liberian leader and warlord, Charles Taylor, was forced out of his country, only to find luxurious exile in Nigeria. Dressed entirely in white for his final speech, delivered from a velvet-covered throne, he compared himself with Jesus: “I would be the sacrificial lamb.” Over the decade of the 1990s, Taylor’s warmongering had promoted the use of child soldiers and brought about the deaths of 150,000 and the displacement of over half of Liberia’s population. He is to be tried for war crimes and crimes against humanity at the World Court in The Hague beginning in 2008. Nkrumah and Taylor are simply two more in a long line of failed messiahs. They happen to be of African origin, but they differ little from their Asian or European counterparts. In this series about men who would be political gods—abetted only too often by many of their countrymen, and sometimes manipulating religious fervor or being manipulated by religious elites—we have witnessed the appeal of the political savior across many centuries and diverse lands and cultures. It is a universal problem. From ancient Babylon to Greece and Rome and the European Holy Roman Empire; from Napoleon’s neo-Roman empire to the awful axis of Mussolini and Hitler; from the communists Lenin and Stalin to their Asian counterparts Mao, Pol Pot and the Korean Kim dynasty—it seems that few places have escaped the depredations of the false messiah. But just when humanity seems to have had enough of the catastrophes that political religions and their leaders produce, another imposter arises promising ultimate peace and prosperity and winning significant support from a misguided and desperate populace. Isn’t it time to learn the lesson that no human being or form of government can deliver us or bring salvation in an ultimate sense? Do would-be messiahs have common identifying characteristics? Even a cursory look at history tells us they do. The first and most obvious trait is that such men find ways to suggest that they are divine, or divinely appointed to solve all human problems, and thus establish their rule. Another is that they align themselves with the sun or the source of light. Then there is a fascination with the Roman Empire and/or preceding false messiahs. And their periods of rule are punctuated by the wholesale destruction of all opponents, real or perceived. What would the final false messiah look like? Final seems the appropriate word, because we cannot know whether the next imposter will be the last. We do, however, have an indication that there will be a final counterfeit christ, and we even have a guide to his nature, as we will see. We began this inquiry by examining Julius Caesar, the first Roman dictator to assert divinity in the pursuit of legitimacy. Caesar sought lifetime rule by claiming descent from the goddess Venus. He suggested that while he was still alive, he be worshiped as a god. It proved a fatal error. Such pride clashed with the ambitions of a group of Roman aristocrats, led by Brutus and Cassius, who assassinated him. Caesar’s quest for immortality was not new, however. The idea that kings were gods had long been part of Babylonian myth. Grasping the hands of the god Marduk in the temple atop the ziggurat, each new king was named the son of the god. Thus deified, he became protector of the Babylonian priesthood. According to the biblical book of Daniel, Babylon’s King Nebuchadnezzar went so far as to set up a 90-foot golden statue and require his subjects to demonstrate loyalty by bowing to it. The image was quite possibly his own likeness, inspired by the interpretation of a dream he’d had about the future, in which he saw a huge statue of a man made from various metals and clay. When Nebuchadnezzar set up the golden image in the plain outside Babylon, he preceded the Roman emperor Nero’s similar act by about 650 years. Some ancient sources report that the infamous ruler and self-appointed deity planned a 100- to 120-foot golden statue of himself as Sol, or Apollo, the sun god. The Roman Empire exerted such influence on the world from the time of Julius Caesar that it became an enduring model for government and rulership. Once the empire adopted Christianity in the third century, ecclesiastical leaders wielded terrible influence, and political powers used them to gain legitimacy. Religion has proven a useful tool in the hands of those who would be political gods, whether they are believers, agnostics or atheists. And it is not only in the West that religion has been abused by earthly powers. Even some aligned with Orthodox, pagan, Buddhist and Confucian traditions have seized on religious belief to strengthen their pursuit of power. It has happened across all political cultures. No system of human government seems to be secure from the rise (and fall) of the false messiah. From pagan imperial Rome to Christian imperial Rome, from the communist Soviet Union and the People’s Republic of China to democratic Italy and Germany, no governmental form has prevented the rise of the megalomaniacal and murderous dictator-god. When a political leader begins to speak in egocentric religious terms to validate his position, and his supporters urge him on, then begins the steady upward ratcheting motion of leader and led. The followers want a leader of superhuman abilities; the leader desires that recognition. The followers seek a messiah; the leader comes to believe he is that man. In the accretion of this kind of power, millions of innocents have met their death. Yet all too often many of them were the same people who supported the man-god in his pursuit of power. What makes a leader a false messiah? The inspiration for this series was a particular biblical phrase. It was something that, according to eyewitnesses, Jesus said in reply to a question about the end of this age of man. His disciples asked Him: “What will be the sign of your coming and of the close of the age?” His reply included a warning: “See that no one leads you astray. For many will come in my name, saying, ‘I am the Christ,’ and they will lead many astray” (Matthew 24:3–5; see also Luke 21 and Mark 13). Has this statement been fulfilled over the past two thousand years, and if so, how? Typically people have interpreted Jesus’ words to mean solely that religious figures would come claiming that they are the Messiah or the returning Christ. There is no question that there have been such imposters. Simon Bar Kosiba was announced as the Messiah as he led Jewish fighters against Hadrian’s Rome in 132. Renamed Bar Kokhba (“Son of the Star”—a messianic allusion), he was killed three years later along with 580,000 of his followers. The young Jewish kabbalist from Smyrna, Sabbatai Sevi, managed to convince many among 17th-century Jewry in Europe, Africa and Asia that he was the Messiah to come. But under pressure from the Ottoman sultan he suddenly converted to Islam and saved his life. Then there was the 19th-century Chinese self-proclaimed Christian messiah, Hong Xiuquan, who set up the Heavenly Kingdom in Nanjing. During the few years he prevailed, 20 million people died. But such counterfeit messiahs are not the preeminent evidence of Jesus’ statement. While they have deceived not a few, there are others who have deceived the majority in their own often sizable sphere of influence. If we analyze the term messiah carefully, we can arrive at a conclusion that helps explain much of the political messianic pretension of the past two thousand years and the deceit and destruction it has caused. For there have been many political messiahs who have attempted to steal the true Messiah’s future role and have deceived many. The word messiah has its origins in the Hebrew mashiach, meaning “anointed one.” When a Hebrew was consecrated to become king, he was smeared with olive oil and became at that moment a “messiah.” His “oiling” made him an anointed one. The equivalent term in the Greek of the New Testament is christos. There Jesus is the Anointed One, the Messiah or Christos. Hence His name in Greek is Iesous Christos; in English, Jesus Christ; and in Hebrew, Yeshua Mashiach. A false messiah is one who comes “in His name,” a counterfeit who declares himself the anointed one—that is to say, usurping Jesus Christ’s ultimate authority to bring peace and prosperity to humanity. Such men claim to have the answers to human problems, to be able to deliver their people, to bring salvation. Yet as explained by the prophet Isaiah, it is only the true Messiah who can bring the kind of perfect government that humanity desperately needs. Isaiah wrote of Him in these terms: “The government shall be upon his shoulder, and his name shall be called Wonderful Counselor, Mighty God, Everlasting Father, Prince of Peace. Of the increase of his government and of peace there will be no end, on the throne of David and over his kingdom, to establish it and to uphold it with justice and with righteousness from this time forth and forevermore. The zeal of the Lord of hosts will do this” (Isaiah 9:6–7). The Roman emperor Augustus (27 B.C.E.–14 C.E.) made messianic claims that preceded Jesus’ warning about imposters to come. His forerunner, Julius Caesar, had been hailed the “universal savior of human life.” In similar fashion, Augustus’s subjects deified him as “savior” and “deliverer,” perhaps in part because the Pax Romana, which began with Augustus, guaranteed relative peace in the so-called civilized world from Syria to Britain from 27 B.C.E. to 180 C.E. In addition Augustus and his successor, Tiberius, who reigned during Jesus’ ministry (14–37), were each acclaimed “son of the god.” Yet both these “divine” rulers passed from the scene, and three centuries later, after a succession of other deified Caesars, the empire finally collapsed into a dark age. Certainly Roman imperial saviors had deceived many into believing they could deliver the ideal society. Oddly, the emperor’s conversion to Christianity occurred only just before his death in 337, when he received a rite of baptism. Whether or not deathbed baptism was usual for people of the time, as some suggest, Constantine’s everyday way of life belied his claim to be a follower of Jesus, Paul and the early apostles. His part in the executions of his wife, his son and his sister’s stepson a year after presiding over the far-reaching ecclesiastical conference of Nicea indicate that he was anything but a true follower of Christ. Aspects of Christian belief influenced his rule, but his adherence to pagan ideas remained evident throughout his life. In grandiose fashion, Constantine made sure that his memory would live on. For years he had referred to himself as the “Equal of the Apostles.” Accordingly, he planned his burial in Constantinople’s Church of the Holy Apostles, built during his rule. His last resting place was a sarcophagus flanked by other sarcophagi said to contain relics of the 12 apostles. He was thus, at the very least, the 13th apostle, or better yet, Christ Himself in the center of his original disciples—a false messiah in both life and death. This pattern of extravagant false claims to savior status has extended throughout subsequent political history. The book of Daniel provides another related perspective when it foretells the rise of the Roman Empire. When Daniel interpreted Nebuchadnezzar’s dream of the future, he told him not only about himself as the head of gold, but also about the meaning of the rest of the statue. The chest and arms of silver signified what we understand to be the Medo-Persian Empire; the belly and thighs of brass, the Greco-Macedonian; and the iron legs and the feet and toes of iron mixed with ceramic clay represented the Roman Empire and its revivals, which would continue until the true Messiah, represented in the king’s dream by a large falling stone, would bring an end to all human kingdoms and establish the kingdom of God on earth (see Daniel 2:31–45). The prophet also tells of another dream of his own that centered on four beasts. They were a winged lion, a bear, a winged four-headed leopard, and an unusually fierce, marauding wild animal. Daniel writes: “After this I saw in the night visions, and behold, a fourth beast, terrifying and dreadful and exceedingly strong. It had great iron teeth; it devoured and broke in pieces and stamped what was left with its feet. It was different from all the beasts that were before it, and it had ten horns” (Daniel 7:7). The explanation is that the beast represents a fourth kingdom to come on the earth following the Babylonian, Medo-Persian and Greco-Macedonian empires. Again, the iron associated with the fourth beast identifies it as the Roman Empire. In the late-first-century New Testament book of Revelation, we find several allusions to prophetic material in the book of Daniel. The author, John, writes, “I saw a beast rising out of the sea, with ten horns and seven heads, with ten diadems on its horns and blasphemous names on its heads. And the beast that I saw was like a leopard; its feet were like a bear’s, and its mouth was like a lion’s mouth” (Revelation 13:1–2). Here is a composite of the first three empires mentioned by Daniel. Like the fourth beast in Daniel’s dream, it has ten horns and all the heads of the other beasts, plus its own, making seven heads in all. Once again it is the Roman Empire, but this time it continues to the end of this age of man, though it sustains a serious wound. John writes, “One of its heads seemed to have a mortal wound, but its mortal wound was healed, and the whole earth marveled as they followed the beast” (Revelation 13:3). The Roman Empire was so severely wounded by its collapse in the west, conventionally dated to 476, that many declared it gone forever. Yet, as we have seen in this series, it survived. It was reinvented, reappearing in differing forms, but always with a backward glance at the might and model of ancient Rome. The first such revival occurred at the hands of the Byzantine emperor Justinian (527–565). 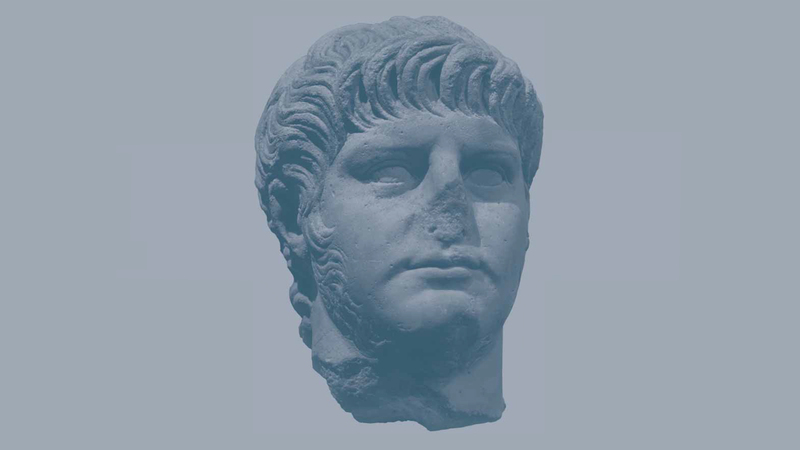 Ruling the remaining eastern branch of the Roman Empire from Constantinople, he succeeded in recapturing Italy and its North African possessions. The emperor’s religious policy emphasized the unity of church and state and the belief that the empire was the physical equivalent of a heavenly counterpart. He saw himself as Christ’s vice-regent and earthly equivalent, and as the defender of the orthodox faith. Yet he didn’t hesitate to exterminate one of his uncle Justin’s perceived competitors, nor to slaughter 30,000 of his own subjects following an insurrection—not the Christ we know from the Gospel message! And so the Western Roman Empire was reborn. According to Barbero, Charlemagne saw himself as the biblical David fighting pagan enemies. Nevertheless, his massacre of 4,500 unarmed, surrendered Saxons marred his reputation. As with other rulers who cruelly enforced the prevailing orthodoxy, Charlemagne’s harsh response to Saxon noncompliance was out of line with the spirit and teaching of the New Testament. In the succeeding centuries, versions of the Roman Empire came and went at intervals. We have surveyed the reigns of Otto the Great (962–973) and Charles V (1519–56) as examples of the revival of the Christian Roman Empire in Germany and beyond. Were they also failed messiahs? In the sense that they saw themselves like Constantine and Charlemagne, as Christ’s representatives on earth, destined to maintain and defend the Roman imperial idea according to an imposed Catholic orthodoxy, they were not faithful to the vision and practice of the Savior they claimed to follow. In this they were counterfeits. Otto’s rule set the course of the German monarchy for almost nine centuries, during which Western Europe’s relationship to the ancient Roman Empire was represented by papal approval of German emperors, while the papacy relied on German emperors for the defense of the Roman Church. In 1519, five centuries after Otto, Charles V was elected (though not yet crowned) holy Roman emperor. According to biographer Karl Brandi, Charles’s chancellor Gattinara wrote to the new emperor on this occasion: “Sire, God has been very merciful to you: he has raised you above all the Kings and princes of Christendom to a power such as no sovereign has enjoyed since your ancestor Charles the Great [Charlemagne]. He has set you on the way towards a world monarchy, towards the uniting of all Christendom under a single shepherd” (The Emperor Charles V, 1939). In 1520 in Charlemagne’s capital of Aachen, Charles was crowned king of the Romans with Otto’s imperial diadem. The next reinvention of the empire came in post-revolutionary France. Napoleon Bonaparte had succeeded in engineering his own rise to power, so that by 1804 he was preparing for his imperial coronation. Three months before the event, he spent time in meditation at Charlemagne’s tomb. He was enthralled with the “Father of Europe,” to the point, some say, of thinking he was the reincarnation of the earlier emperor. The ninth-century ruler’s influence was evident in a number of ways at the coronation ceremony. Even the crown was a copy of the one Charlemagne had worn. Official paintings of the occasion show Napoleon as a Roman emperor, sometimes with a victor’s laurel wreath fashioned from gold. Napoleon, like other French leaders before him, was sure that he had been destined to rule the Holy Roman Empire. The Habsburg king Francis II, determined not to allow Napoleon to usurp the empire, dissolved it in 1806. But Napoleon remained intent on dynasty and world dominion. Between 1792 and 1815, his aggression took his forces to almost every corner of the world. He failed, of course, and with his death the idea of the medieval Roman Empire seemed to disappear. But its image lived on in the imagination of some, including those who established the Second Reich, or German Empire, in 1871. Indeed, the enduring memory of Charlemagne, Otto the Great and Frederick II appears to have influenced Adolf Hitler, whose Third Reich, joined with Benito Mussolini’s fascist Italian state, proved so destructive in the 20th century. It was Mussolini who in April 1922, a few months before the march on Rome that brought him to national power in Italy, declared, “We dream of Roman Italy—wise and strong, disciplined and imperial. Much of the immortal spirit of ancient Rome is reborn in Fascism!” According to Peter Godman’s analysis of this speech, “Mussolini wished to be regarded as a new Augustus, a second Caesar . . . but also the Savior.” By 1936, when his troops had successfully invaded Ethiopia, the Duce was able to proclaim that Italy again had its empire, “an empire of peace, an empire of civilization and humanity.” His axis agreement with Hitler proved his downfall, however, and exposed the hollowness of his messianic claims. Captured and executed by partisans within days of Hitler’s own defeat, Mussolini’s corpse was put on public display and defiled. Of course, the great gamble failed, and Hitler shot himself in his Berlin bunker as Soviet forces closed in on the city in 1945—truly a failed and false messiah. In a departure from strict reinventions of the Roman Empire, we also considered Lenin, Stalin and Mao, and Mao’s messiah-like offspring, Pol Pot and the Kims of North Korea. If space and time had not precluded it, we could have investigated the Japanese ruler cult and the divinity accorded that nation’s emperors. But Asia’s communist leaders certainly aspired to messiah status, and the Soviet Union certainly had historical links to Rome through the Orthodox Church and its view of Moscow as the Third Rome. Religion also played a part in the Pol Pot regime and the Kim dynasty. In the one it was a sect of Buddhism and in the other a new syncretic religion fashioned from Pentecostalism and the Korean spirit of self-reliance (Juche). While the link with Rome is more tenuous in these latter two cases, the preoccupation with messiahship is all too evident. It was also certainly the case that millions died under the false liberation promised by these counterfeits. Has the image of the Roman Empire now truly disappeared forever? If the past is any guide, it would be premature to say so. That imperial model, in association with a well-defined religious tradition, has come and gone many times. There are those who see the developing 27-nation European Union (EU) in imperial terms. When its leaders met in 2004 at the Campidoglio, the political and religious center of ancient Rome, they did so to celebrate their progress toward a European constitution. Inside the ornate Orazi and Curiazi hall, where the 1957 Treaty of Rome establishing the European Economic Community had been signed, the leaders agreed to the constitution (not ratified as yet) under the gaze of the statues of 17th-century popes Urban VIII and his successor Innocent X. Perhaps not many of the dignitaries present appreciated the symbolism: the two pontiffs “overseeing” the event were the very ones who had witnessed the division of Europe and the profound weakening of the Holy Roman Empire as a result of the Thirty Years’ War and the consequent Treaty of Westphalia. The framers of the constitution carefully avoided any reference to Europe’s Christian heritage, however, despite the protests of the Vatican. At this point, the EU is envisioned merely as a secular power. Though it has only an incipient military force and lacks a unified foreign policy, the union already has varying degrees of economic, legislative and judicial power over its wide swath of nations. Its geographic expanse is beginning to rival the original. Thus, in terms of Daniel’s dream, it may yet prove to be the precursor of another powerful iteration of the idea and image of the ancient Roman Empire. From the vantage point of the present, if the final system were to embrace democracy, free-market economics, and some form of ecumenical sharing of religious authority for the sake of all peoples and beliefs, it would provide humanity with an offer seemingly too good to turn down. Already many seem to anticipate a globalized democratic world order as their only savior. Interestingly, the often puzzling book of Revelation has sections devoted to a description of the final system and its leadership, which is an extension of the old Roman order in some way. It is clear that the system will gain worldwide acceptance (Revelation 13:7–8) and will bring peace and prosperity on a very wide scale before it, too, falls. What we read about in Revelation is a global economic, military, and politico-religious system. A description of its tradable goods is found in chapter 18, verses 11–13, and includes “gold, silver, jewels, pearls, fine linen, purple cloth, silk, scarlet cloth, all kinds of scented wood, all kinds of articles of ivory, all kinds of articles of costly wood, bronze, iron and marble, cinnamon, spice, incense, myrrh, frankincense, wine, oil, fine flour, wheat, cattle and sheep, horses and chariots, and slaves, that is, human souls.” It is almost like reading a modern commodity report. Substitute “armaments” for “chariots,” and you have what the world trades in today. Ominously, the system also traffics in human beings, their minds and their bodies. This is the same system that Daniel and John described as being irrevocably broken by the coming of the one true Messiah to set up a kingdom of universal peace, justice and righteousness. Then, to the everlasting relief of humanity, the era of the false messiahs will be over. Emilio Gentile, The Sacralization of Politics in Fascist Italy (1996). Martin Meredith, The Fate of Africa: From the Hopes of Freedom to the Heart of Despair (2005).